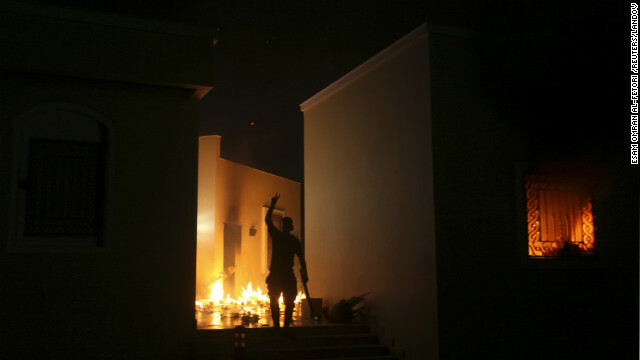 A protester reacts as the U.S. Consulate in Benghazi burns. The U.S. military did not get involved during the attack on the U.S. mission in Benghazi, Libya, last month because officials did not have enough information about what was going on before the attack was over, Secretary of Defense Leon Panetta said Thursday. At a Pentagon news briefing, Panetta said there was no "real-time information" to be able to act on, even though the U.S. military was prepared to do so. "You don't deploy forces into harm's way without knowing what's going on," Panetta said. "(We) felt we could not put forces at risk in that situation." A defense official provided more context on Panetta's comments about the decision-making involved in not sending U.S. troops to the consulate being attacked in Benghazi. He said there was a drone aloft but not directly over the area at the time the attack began. He said the drone was redirected and arrived in time to record some of the attack. But he described what the drone saw as "looking down, seeing a bunch of buildings and fires, a lot of chaos on the ground." He said it was not enough to discern exactly what was happening. "We didn't have good eyes on the situation. There were security forces there on the ground, but they're in the middle of a firefight - not sending a Sitrep (Situational Report). The official could not reveal the specific reaction times for the military's Fleet Anti Terrorism Security Teams, which are classified, but said "it would be physically impossible for them to get there in time to intervene in that attack from say, Rota, Spain." He cited the time it takes just to get their transportation in the air. The official said "these situations normally deteriorate over time ... but usually in a few days, not two hours." He explained that even quick-reaction teams are often positioned for places where intelligence shows a "deteriorating situation" near an embassy. The official also provided context for Panetta's and Gen. Martin Dempsey's remarks about criticism on the response. "It's not helpful to provide partial answers," Dempsey said. And Panetta criticized what he called "Monday morning quarterbacking." The defense official said it was directed at criticism coming from pundits and Capitol Hill. "In perfect hindsight, yes - we'd do it differently. But how it looks weeks later is not how it looked at the time. "You had the movie, the 9/11 anniversary and unrest in various countries in that region. All that factored into the decision to put troops on a heightened state of alert. But that doesn't mean forces are positioned everywhere in the world, ready to run to the rescue. We're not the fire department. And there was no actionable intelligence that Benghazi was going to be attacked on 9/11." Next month, the Democratic-led Senate Intelligence Committee will hold a closed hearing in Washington to review the security situation and intelligence surrounding the Benghazi attack, according to a committee announcement released Thursday. The hearing, not open to the public, will review intelligence collection and threat reporting in Libya and other Middle East countries before the September 11 attack on the U.S. mission as well as what was known and who is responsible for the attack, among other issues. A number of government investigations continue into what happened on the attack. To This Girl in seattle? We know you are a plant for clinton or obama. Clinton and Obama should be tried for treason. They watched frrom the drone what was happening (the murders) and did nothing all for the sake of Obama's election? Not only that, Obama lied so many times that he said it was a terrorist attack from the beginning (remember at the debate he was insulted?) 60 Minutes last night finally aired his Interview done the day after the murders and in the interview he was asked point blank if it was a terrorist attack and he said he didn't know yet. Please, at the second debate he lied and he has a bad habit of alway lying. I hope he gets evicted tomorrow but I won't hold my breath, because he and his whole admin are crooks and will try desperately to steal the election. Goodbye Plant. That's correct, Rocky. They should be tried for treason. I've been searching all over the internet for what consequences Hillary, Obama and Panetta will face for their abysmal incompetence - no wait - deliberate malfeasance. Are they just gonna' walk free after turning a bling eye? Further, I saw in a YouTube film last night that Hillary actually "went home" at 11 PM and "let her staff handle it." I can't believe this creature (Hillary, I mean) has the gaul to run for president. I also agree with JohnVoter - Why wasn't security heightened in the 6 months prior to the Benghazi attack. Instead, at the Hearings, it came out that a U.S. military unit was actually "told to leave" Benghazi right after the UK ambassador was attacked in his car. Here's what I think - Obama is now an out of the closet Muslim ... and he's taking care of Muslim interests. EG: All he could harp on over and over after the Benghazi attack was "the movie." In fact, he seemed to be so insulted by that, it rendered him incapable of making judgments. I want to see Obama, Hillary and Panetta charged with treason for this. However, I don't agree that putting troops in that satuation was hardly necessary. How about a couple screaming F-18s doing a drive by? So please tell me - what will be done with these 3 gangstaz? Well, we have an AP report that gives an " official ". incoherent. and, speaking at least for myself, unbelievable explanation for Panetta's failure to act on 9-11. It's just in time for the election. Political geniuses must have labored for days, ordering pizza and Chinese take-out so they didn't have to leave the Spin Room until they had what they thought was a plausible explanation. The telling statement is that Pentagon Press Secretary (not a General or any one of consequence who might explain someday to Congress if they aren't all silenced with threats to remove their stars and their retirement pay) says Panetta "quickly" met with his advisers after the attack began. Then, "within a few hours" he had ordered units to move to Lybia. Well, hell, Secretary Panetta, it was OVER within a few hours! The AP report further claims that the Pentagon was correcting mistaken reports that the CIA told its' own people to stand down. I don't believe that was the allegation. I believe the allegation was that the CIA on the ground was told by un-named higher ups to stand down. If it is true as reported that the CIA tried after the attack began to get heavy weapons from local contacts to deal with the situation, that alone smacks of a crippling and impotent foreign policy for operations in Lybia, if not all over the Middle East. And finally, the report states that there were no American forces poised and ready to move in once the attack began. Really. After our own Ambassador asked how many times for more security in the months and weeks prior to his own murder? And we are to believe he just decided to take a drive to the No-Man's-Land that Benghazi was and spend 9-11 there with precious little security rather than stay at a more secure site? And no one knew or thought of backup for his safety while he visited this Hell-hole? So, hurricane and all, we know you[re really reporting the most needful news, and that after all these men having signed on for risky jobs, I mean, what could you expect, right? But just one last time, CNN: Where are the reporters who are supposed to be asking the Who-What-Where-When-Why questions? Oh, I forgot, wrong network–that was Univision. Why aren't you ashamed? Are you really going to just sit this out and let this travesty happen? Yep you are, and then you are going to all take the pledge and openly become the State-Sponsored Mediasky after the masses you made darn sure were going to remain ignorant as possible re-elect the Opaque Obama. on Election Day we should vote with our Feet. Take a Boot and give it a swift Kick up someones @$$, That is the American way. The Cover-Up has been uncovered. American deserves better than this. We need Leadership, now. Key task force not convened during Benghazi consulate attack! Why are you not covering this? This administration did not support its representives abroad, they didn't assist in defending a United States Embassy, they watched for hours while Americans died, and Obama has the nerve to cheapen their sacrifice with a COVER UP! DISGRACEFUL! Obama's first responsibility is to provide for the safety and security of the American people and the United States. If it is proven that he gave a "Stand Down Order" when Americans were in harms way, who else is there to blame? Of course he did not shoot our people, however, he must have watched it happen and decided not to send in troops to help. He must have thought he had a good reason, however we have soldiers that are highly trained to go into harms way. They had time to save all Americans and at the same time, deliver unspeakable devastation on the attackers. A firefight that lasts over seven hours is not a lost cause when help was one mile away. This is going to ruin his Presidency and legacy. CNN is so biased it makes me sick. What kind of journalism is this? Not one comment on the new evidence that became available on the attack in Libya! You should move your headquarters to Moscow. Shame! CNN = Communist Network News?? don't insult the Russians. The most important question is why was AFRCOM's Commanding General Ham relieved of duty at the height of the attack and replaced. He had a Rapid Response Team ready, he felt going in was viable based on his intel. It was Panetta and no one else who didn't want the rescue most likely for political reasons. The next question is whether or not the CIA in Libya was in fact transferring weapons from Libya to Syria through Turkey. THis has been alleged by many, Ambassador Stevens had dinner the night of the attack with The Turkish Ambassador. our now dead Ambassador and the others who died were sitting ducks. Pretty soon Obummer-in-Chief is going to be a LAME DUCK. One and DONE. if he cant protect American LIVES then we DO NOT NEED HIM to be sitting in the White House. go play Golf. he is better at Golf than protecting American Lives. Do you know that jets go very fast? One jet could have taken out those mortars with laser guided munitions. General Ham stated that assets were available that could be used, he was the one who had those assets ready to go. Sorry, those people are imbeciles if they don't think jets could have been used. Why would a ex-navy seal use a laser point if support wasn't already in the air? Something was in the air or he wouldn't have been using the laser pointer, the request to take out the mortars was denied, they didn't say they couldn't take out the mortars, the request was simply denied. Sorry but spin all you want, no one believes anything you say because it's a fabricated story tale since the WH started spinning it. Good thing Panetta wasn't a general in WWI or WWII, or for that fact a general in any war. We can't go in because we don't know exactly what's going on. No one has all the information they need when getting into a battle, you can plan, but plans usually go out the window once the battle begins. So answer this Panetta, you were worried about causing friendly casualties? They had laser points on mortars, requested that they be taken out, you or someone else denies that help, and those laser points will allow a laser guided munition to land right on top of the mortar without hurting our guys. so what was your response again? I would like to know why CNN is not covering this story. This was a major cover-up... that much is more than obvious. I think an earlier post had it right when they pointed out the CNN is a business that caters to a certain type of person. That type of person doesn't really want to know this type of fact. So true. Find youtube of Pat Caddell, lifelong democratic pundit stating he believes the press is in the tank for Obama and it is sickening that they are not asking more questions. Good Democrats want to know Mr. President. Disgusting for sure. forces, laser assistance with live footage denied help to stevens . Everyone is capable of bending the truth because everyone has different backgrounds. They are not bending it with malice of intent but because they are ignorant of the details. Ignorance is not a bad thing if you know you are ignorant. Boy that line sounds awful glad I'm not running for anything. Ignorance can be remedied by teaching. You cannot teach if you are yelling so loud that people do not listen. As for your first points, people must forever be place in situations of danger for the sake of peace. There will always be people willing to go into danger and people willing to send them. The outrage about this situation is that it "seems" like the people on the ground were abandoned. You cannot, must not ever do this for any reason. I am not saying they were abandoned I was not there in Benghazi or in the Situation Room. I don't know the answers but I need them to make an informed decision. Does that not make sense? If Obama REALLY abandoned them.... Do YOU think they would be quiet about this????? If he abandoned these people.... The Diplomatic Blogs would be telling these same stories.. Unfortunately blogs are not factual material. I believe that a lot of what Fox is getting is also of the same nature, not factual but indicative. That is the reason news outlets should be hammering people that know for information so they can get the facts. The question people are asking on this comments section is why are we not getting factual information? The are for a lot of people, myself included, is because they big names are not throwing their weight around to get at the answers. I do agree that people are making this political I wish it were not so but it has a strong bearing on the election in a week. I wish we had the time but we don't. This is why people in this comments section are so angry. They are disappointed in CNN as well as others and are hoping that they will listen. examples being... Do they feel that Obama dropped the ball???? Do they feel that Obama abandoned them???? hey genius gurl in Seattle. there is no such word as rabbid. You were better off letting people think rabbit was an auto correct mistake. Plus your continual, incessant protecting of obama is very suspect. Are you part of Hillary's staff? They are great posts for a paid troll. Reason 30 people were pulled out of Benghazi is because of the ex-seals efforts, those same guys had laser points on the mortars that eventually killed them. Guess what, their request to take out the mortars was denied. Can you give any possible reason why a simple request like that is denied? The military can use laser guided munitions as easily as we get up out of a chair. A gunship or a jet could have done the job, but the President couldn't even do that? To CNN: Please keep this story active and push the Obama administation for the truth now. We can't afford to wait until the November 15 investigation. We need the truth before the election. How can the military trust the commander in chief? Tyrone Woods (and others) requested back-up three times and was denied three times. The last request was for air support. He had a laser pointed on the mortar unit that eventually killed him. Air support could have taken that mortar out using the laser pointer and not harmed any U.S. personel. Panetta's claim holds no water. Based on interviews with multiple military personel, Obama is the only one that could have ordered back-up and he failed to do so. Why? And why did they create the stupid claim that a video caused a spontaneous reaction and have Susan Rice promote that theory on 5 Sunday TV shows when they watched the attacks live and knew as they were happening that they were organized. By the way, the mortar takes time to set up and may have been set up in daylight, well ahead of the attacks. Obviously you don't have all the information available. See my reply below your earlier post. One of the individuals defending the Annex was on the roof of a building with a machine gun and a laser sight, which he had aimed at the mortar. He radioed for air support, but it was denied. He was killed by a mortar round. There is a transcript of this timeline. Our air support is sophisticated enough that it could have easily taken out the mortar using that laser. Never heard of them before? They're used all the time in warfare, the President denied a request to take out those mortars, a laser guided munition would have done the job no problem, you're hysterical childish response to the real facts show this must be getting to you quite badly. The president is doing BAD in the polls, must be your reaction to that. You know what's nice? We can agree to disagree and still enjoy the conversation =). agree with you on this one TrumpetGuy. just a gurl is just a troll. So... ANYONE who disagrees with you right wing hacks is a troll.???? Former Secretary of State Condoleezza Rice believes the death of the U.S. ambassador to Libya and three other Americans was not due to any breaches in protocol, pointing instead to the fog created by chaotic situations like the attack on the Benghazi consulate. “There was no gunships in the region”. “There was nothing that could have prevented it”. “It was over in about an hour”. “Forces got there as soon as possible”. “To politicize this is very hurtful”. Former Ambassador Nicholas Burns explains whether the Benghazi attack will be a major component during Monday’s foreign policy presidential debate. General Jack Keane says Obama response was appropriate, quick…. and effective for this type of attack…. Condi debunks critics and says wait for investigation….. Normally I would be willing to wait for an answer because I do believe in the process. The issue is the timeframe. The American people do not want to elect someone that left our people in danger. I will say that I could back the response if I knew why he did what he did but he is not answering questions. I would like to know more about what happened. I want an informed public for the election. I don't want someone elected that could be impeached right away. At this point, the special security team, the quick reaction security team from the other compound, arrive on this compound. They came from what we call the annex. With them – there are six of them – with them are about 16 members of the Libyan February 17th Brigade, the same militia that was – whose – some members of which were on our compound to begin with in the barracks. As those guys attempt to secure a perimeter around Building C, they also move to the TOC, where one agent has been manning the phone. I neglected to mention from the top that that agent from the top of this incident, or the very beginning of this incident, has been on the phone. He had called the quick reaction security team, he had called the Libyan authorities, he had called the Embassy in Tripoli, and he had called Washington. He had them all going to ask for help. And he remained in the TOC. So at this point in the evening, the members of the quick reaction team, some parts of it, go to the TOC with the Libyan 17th Brigade – 17th February Brigade. They get him out of the TOC. He moves with them to join their colleagues outside of Building C. All the agents at this point are suffering from smoke inhalation. The agent that had been in the building originally with the Ambassador is very, very severely impacted, the others somewhat less so, but they can’t go back in. The remaining agent, the one that had come from the TOC, freshest set of lungs, goes into the building himself, though he is advised not to. He goes into the building himself, as do some members of the quick reaction security team. It's interesting that when two democrats that sit on the commmitte that will be investigating this were asked whether the drones were armed, they both declined to answer. My thought is that if the drones were NOT armed, both would have quickly indicated that, since it would have gotten Obama and/or those watching the attack take place off the hook for not immediately providing the air support requested by by the individual with the laser. Since they looked very uncomfortable in not answering, it makes me wonder if the drones were armed. I, and I'm sure many others, would like to know that fact. That would prompt even more questions. FYI Intelligence drones are normally armed with machine guns but don't have hellfire missles. determined to attack on US soil???? was Reagan Impeached for hundreds of Marines dying on his watch????? "rabbit"? You must have gone to public school. I for one appreciate the civility you are trying to show. You are being attacked by others, it seems to me they are attacking the situation and because you are well spoken, "rabbit" instead of rabid not withstanding, people are attacking you. They would not do so if you did not have valid points, if they were not somehow valid you could be ignored. I do understand that the increased security was for Tripoli, I do understand that forces were dispatched, upon arrival they were delayed by Libyan forces and possibly for good reason. Things do move fast and some governments especially new ones can have issues like this. I also understand the drone video would not have given enough resolution to make out specific detail. According to some reports, I don't know where from, someone had a laser designator on the weapon that killed 2 men. It would believable that they would not have turned on this device if they thought it was not going to be used. Why then was it on? Why was there not more security with the Ambassador when he went to Benghazi? Was it simply because they were trying to keep it low key? Why take a meeting on 9/11 in an area known for being attacked and not have a backup plan in place to support what should have been thought of as a trap? If the meeting was to be kept quiet how did forces know to "riot" there? Why call it a riot about a You-Tube video that turned into an attack when we know it was an attack from the beginning? We know the President was informed about this early why make it something it isn't? Why does the President not answer the detractors? I have other questions but not the time to list them all right now. I do believe the President is a good man. I believe he did what he did for the best of reasons. I may not believe in those reasons thus I need to know what his are before the election to make an informed decision. We need more of this type of discourse, but it needs to be in the realm of the media so that the public has those answers. That is the reason, I assume, people become reporters. I hope that outlets like CNN, NBC, CBS and ABC would ask these hard questions on my behalf. They are important, they should not be ignored. General Keene conveniently leaves out the fact that the initial response from the CIA Annex was DESPITE orders to stand down – twice. Woods and others with him decided to defy orders from their superiors (Obama?) to NOT go help. Keene also ignored the fact that a laser was pointed at the mortar and it could have been taken out without endangering American lives; doing so would have saved American live. NIck Burns says politics should be kept out of this. I agree, BUT by using the video as an excuse for the attack, the Obama administration is who brought politics into this situation – not those questioning the inappropriate actions and the lies. According to reporting by David D. Kirkpatrick and Suliman Ali Zway of The New York Times, eyewitnesses have said there was no peaceful demonstration against the video outside the compound before the attack, though a crowd of Benghazi residents soon gathered, and some later looted the compound. But the attackers, recognized as members of a local militant group called Ansar al-Shariah, did tell bystanders that they were attacking the compound because they were angry about the video. They did not mention the Sept. 11 anniversary. Intelligence officials believe that planning for the attack probably began only a few hours before it took place. Has CNN stopped doing investigative reporting? Why is Fox News the only medium digging for the truth about the attacks? It was Fox News who published the e-mails and every new development seems to be emanating from Fox. Has CNN decided to wait until the November 15th for the details? What if there really was a cover-up? Doesn't CNN think the truth about the attacks is relevant especially before Election Day? CNN is in the tank for Obama...witness NO reporting on the president's conflicting stories on the attack, NO reporting on the story that officials were watching this unfold at the time, not afterward, NO reporting on the refusal to provide support or additional manpower to help prior to attack and during attack...just watch any "news" by Soledad O'Brien to get the picture of where the CNN loyalties lie, and what they will vs. what they will not report on. Be prepared if Romney wins, for a CNN blitzkrieg of in-depth news covering how Romney's last 20 years of work with the Mormons was conducted...but still, NOTHING on Obama's last 5 years. Get it? If you can't read CNN news and get the idea of where they stand w/r/t this and other elections...you're slow. Everyone and I mean everyone needs to call their local news channels and ask why they are failing to cover this story. Mention it is the first time a US Ambassador has been killed since 1979 in Iran. If enough call, perhaps they may have to report the news. Also, call the Democratic Rep/Sen also and tell them Obama needs to come clean before the election. cnn and the main streem media are Obamas campain madia they are left leaning.They don't know fair and balenced.It's a sham. Dear CNN – can we have more coverage on this. Election is near and we want to know more. Being a news organization that is in the middle, it matter more if it comes from you. This story should remain at the TOP of the news stories until the President takes the time to answer the questions. Why didn't he and Hillary, having demonstrably been given more than enough information to know there were Americans under fire at the Embassy, do something? This paper president has time for The View and giving a press conference about the storm; but not a peep about Benghazi?!!! Shameful of the president and shamefull of CNN not to keep this story where it belongs. Obama, Biden, Hilary and Panetta must have huddled to get their story straight when they came up with the idea to blame this on a stupid video (that no ones seen) and decided to send Ambassedor Rice out to play the village idiot on the Sunday news shows. The fact that they knew that the attack was a terrorist attack and still lied is enough to start impeachment steps on all of them. Even after they brought the bodies home, H. Clinton told the father of one of the dead Navy Seals " dont' worry. we are going to get the guy that made the video". I can't believe the media in this country are deliberately trying to ignore this story because they know it will damage the president's chances of being reelected. For that reson alone I will vote for Romney and if the president is still elected then I hope they start impeachment steps to get rid of him as our president elect. Again, we need to contact every local news network to demand news on Benghazi. If these news outlets are publicly owned, sell their stock. Maybe then they will get the message when they are facing massive pink slips. "U.S. military did not get involved during the attack on the U.S. mission in Benghazi, Libya last month because officials did not have enough information about what was going on before the attack was over," I can read between the lines here. This is NOTHING more than serious trust issues between military intel and the White House. And we all know the message that sends to our nation's men and women in uniform...don't we? It was not given to cover the fact that al quaeda is alive.it would make obama look like the incompetence that he is.We need a leader not a community organizer.Send BHO back to chicago. Docs show Obama overruled Clinton to deny security Benghazi ? True or False ? Trick or treat ? Who denied the extra security in Benghazi ? I's like a "Ball Of Confusion" by the Temptations. "It's Growing".....? Like the size a fish that a man says broke his reel. Oh really and is Susan Rice fired ? I repeat: You didn't elect CNN. They run a business that caters to a certain crowd. They are NOT practicing what is commonly known as Journalism. If you want the truth you will need to write your elected officials and let them know you want it now and unvarnished. John Kerry will tell you about procedure and the Accountability Review Board. They have 60 days to get this board up and moving and it's an independent panel. Kerry wants a bill passed the independent review board reports to Congress per reports. Who's on the Accountability Review Board ? I think American Citizens need to form their own Investigative Review Board and we the people will follow up on what the heck is going on with our National Security and Benghazi. The misleading of American citizens was uncalled for ! and to go farther, within minutes, several generals etc were all re asigned. What does that say. I wouldnt think they would do a reasignment during an attack????????????????? Precisely. Everything the POTUS does or says is framed by "How does this make me look"
It is sad and pathetic that CNN is trying to bury the issue. Obama and his Administration failed to protect American Lives on American Soil. maybe he is The Leader of the American Brotherhood, not willing to shoot back at his Brotherhood cronies. Does fox news have any actual information other than stories from a "source on the ground"? Why does the right feel that every outlet (including overseas news agencies) is ignoring this but there's some major conspiracy that is unraveling? Didn't they learn after the F & F Fortune article that witch hunts don't work? I will not disagree that to me it looks like Fox is biased. My issue is with the timeframe here. We are about to elect a President and it is important for everyone to know if the President failed and how or if what he did before during and after is in the National interest. I can easily construct something within my mind as a story to explain what happened. Barring additional information and believing my sources, Fox News, to be biased I have to make a decision. It would be better to have more information, more reporters digging into it to find the answers. They are the watchdogs for our country. It's this simple, I believe every President does what he believes to be right and just for our country. I may not agree but he is the President, has that mantel and authority and you must respect that. But I need to know if what happened in Benghazi was for political reasons. If so he should not be in office. If he is elected and then impeached the will of the country has been trumped by politics. That is not how this country should work. All I am asking for is more information from respected reporters. Not looking for a witch hunt. But if only one side is talking and the other side stays quiet it implies something was done wrong. An explanation by the President would clear it up, he is not explaining thus it is the reporters job to find the answers. It seems like CNN, NBC, CBS, and ABC are ignoring this. You don't have to rely on Fox. There are plenty of other reports, just not the big 3. You do have to be willing to do some searching though and not have your mind closed. There are many sources reporting this, just not the 3 major networks. The information coes from a variety of sources, some of which include subsequent administration admissions. Those being attacked emailed their families and others and the attack from the start on the CIA annex till killing of the last American lasted 6 1/2-7 hours. In fact, there is so much information you can't get it all from a single source. Whoops, got the date wrong on my prior post. Should be Monday, October 29, 2012, not "November 1, 2012." That's what happens when one has a job, four kids, and a home to take care of, and one has to do CNN's job as well. MELT THEIR PHONES DOWN!! TELL THEM TO COVER BENGHAZI!! Well, CNN, it's Monday morning, November 1, 2012, and I am still checking your site twice a day looking for the Benghazi report on the front page, and I'm still waiting. CNN, you are insulting the American people. You are hurting the American people. There is only one conclusion we can come to, and that is that you take direct orders from the White House. You and the others that are not reporting this. This is not paranoia on our part. There is no other reasonable explanation for this gross cover-up. If my allegation is not true, can you please, please, tell the people why you refuse to cover this? Please, we need to know why. The fact that you're not covering this story is not even the issue anymore. The issue is why. Who makes this decision? Were your reporters told to "stand down"? I implore you reporters, any one of you that have a semblance of decency left, stand by our military. Tell the truth. Don't worry you only have to avoid reporting this story for another 7 days untill the election is over. But if it turns out that there was a coverup and the administration has been lying to the American people, heads will roll regardless of when the truth comes out. Would you rather see Obama lose the election now, or be impeached later? I truly detest CNN for burying this story. This is an unbelievable dereliction of duty by the president followed by a massive coverup based in lies. This isn't going away, it is only going to get worse for Obama. CNN will do its best to provide cover, but this time I don't think it will work. All Americans should demand the president answer questions on this. Pathetic "journalism" CNN. Failure to defend our embassy (US Soil) from all enemies foreign and domestic is a treasonous act that can not be buried by excuses. Mortar attack misses embassy, hits nearby girls' school instead. I won't argue your facts. The issue here is that on a day that we should have stepped up security on every high level diplomat we didn't. If the Ambassador was going to Benghazi for a meeting on a day that has significance to terrorists and to a place that was very hot, the British and Red Cross evacuated earlier in the year, than he should have been given the security he requested. Barring that they should have sent in forces to secure the area after the attack. No one is saying why that didn't happen and people are getting frustrated, I hope you can see why? I have been watching Fox News for the last few days. I am not an avid newsie but I wanted more information about what was happening with the Benghazi incident. While I don't claim to believe all I hear there it would criminal for it to be the only major news source for the information. I simply do not see any other major news TV news outlet covering this story and thus I am left with less than satisfactory answers. I had hoped that we would have better information by now. Interviews with the survivors, stories about the heroism of those that rushed in to save 30 people. Leave the politics out of it but WHERE ARE THE STORIES? Not even Fox News has played any interviews of the people that survived. The very real impact of this story is that the American people deserve to know what kind of leadership we will have in the one we choose. So far, since Fox is the only coverage, I have to come to the conclusion that Obama or his Administration messed up badly. And Panetta saying that it isn't safe? That makes me the maddest of all. It was proven that night that military men and women would run in to any situation to save American lives no matter the danger level. No matter the situation we should have sent forces over to protect our people. Where was the leadership? Where are the stories? Where is the media? Where is CNN? Please tell me? I would really like to know! Interesting how CNN tried burying this article in the World section. They witnessed this live and did nothing..
1. They had real time feeds. He's lying. 2. At what point DO you decide it's OK to send in a Tier 1 QRF? It's what they get PAID TO DO! It may take months, even years to know what actually happened in Beghazi. Remember how long it took for the truth to come out when Pat Tillman was killed in Afghanistan in 2004. One thing that I have heard or read online a couple of times regards the length of time the Consulate was under attack. One online article stated the Consulate was under attack for several hours. In a video I saw yesterday where the father of one of ex-SEALS who was killed also stated more than seven hours. In the three emails released, the first being at 4:05PM on September 11, 2012 there was NO sense of urgency indicated in that email. The second email time stamped 4:54PM, September 11, 2012 indicated the attack was over. Obviously, the time between these two emails was 49 minutes, not 7 hours. I would just like to know if the attack lasted 7 hours or 49 minutes? If in fact the duration of the attack only lasted 49 minutes, I just don't see how military support could have arrived at the Consulate location to counter the attack. The American public needs to know the TRUTH! It will take months for sure.. only because the Democrat creeps in the Congress will do everything they can to not let the American people know. It will take months because the Democrat "journalists" who have the ability (at least they purport to have ability) and the resources to learn the truth won't do their jobs. Apparently, the attack lasted seven hours, and the survivors are saying that they were on the phone in real time asking for support. The survivors have stated that there was no interruption in communication, and that they were constantly communicating directly with those who could have given them support. I'm I wrong? Didn't Sean Smith send a couple of messages to his online community a couple hours apart. The First -"assuming we don't die tonight" and several hours later "gunfire" and a four letter word. Actually, there were 2 separate attacks. The attack on our Consulate lasted about an hour, starting around 9:30 pm according to reports. The second attack at the CIA Annex (about a mile away form the Consulate) starting around midnight and lasted until 4 am when the 2 ex-seals were killed by a mortar shell. So the actual elapsed time from the start of the first attack until the end of the second attack was about 6 1/2 – 7 hours. We had assets in Italy that could have flown to Benghazi in about 1 1/2 hours to help but there were never given authorization to go. If Obama had given the green light to send help there is a possibility that at least 2 American lives could have been saved, and probably avoided some additional casualties that survived. And don't believe for a minute that HE didn't know what was going on and that HE didn't make the call. Obama and his Natl Security team met in the White House at 5 pm that afternoon (Washington time) but they did NOTHING to try to help our people. Our guys at the Annex were told twice to "stand down" but instead 3 brave Americans disobeyed orders and went to the Consulate to help. They rescued some people there and brought them back along with Sean Smith's body to the annex. If not for their actions, more Americans could have died that night. As Americans, we deserve to be told the truth by our so called "Commander in Chief" He got the call that all Presidents get sooner or later, and he FAILED the test. He was provided "real-time" intel from the 2 seals/others on the ground. Lying P.O.S.! LIARS!!!! No cursing, no bad language but the truth and my post gets kicked off...LIARS!!! Could not put our military forces at risk to save our ambassador ? My WW2 father is turning in his grave. Seriously the liberal news media should be wearing Vote Obama tags not Press tags. This is not just an administration cover up but a Press cover up. Shame on you CNN! You are merely an extension of the Obama lie machine. Sorry, Josyjo, there are more important things to attend to...like a Cat 1 hurricane that hasn't even TOUCHED land. Mr. President has to look presidential at ALL costs...and by golly, the media will help him do that no matter what! CNN is nothing but Obama propaganda. I just do a bias check, and I never rely on CNN for news. Boycott them and all their programming, except for bias checks. If they start reporting fairly, that would be a different matter. Benghazigate is now a focus, but it should be remembered that there have been countless Benghazigates in Afghanistan, where US forces were denied air and artillery support while under fire. That should be the real focus of this conversation. What happened in Benghazi is what has been going on in Afghanistan for some time. It’s the outcome of the Obama Administration’s CVE and Hearts and Minds program that puts Muslim sensibilities first and American lives last. The military was ready – we never got the call. Mr. Panetta's comments are amazing, and he must think we are all idiots. Real time...what and when does that happen? To think he would not want to put our troops in harms way to save our own, because of incomplete intel. That's like having a station of firefighters two blocks from a burning house with people trapped, and not calling them. A true leader would not have hesitated for an instant, nor would our military be concerned about being placed in "harms way". This is a sad example of the lack of leadership with the commander and chief. You are an id iot! Why do you think that Obama replaced Petraeus? Panetta 's excuses don't make any sense. This report is B.S. "No real time information" huh? Between two drones we know were there, the multiple requests for assistance that were denied, constant radio contact w/ the forces in the compound, this is just one more piece in this scandalous cover-up. Thank thanks to CNN for not doing their job to cover a significant breaking news story b/c it would not provide their usual cover for the administration. Shame on you. 4 Americans are dead because someone denied them ANY help... they could have provided close air support, a gunship, etc w/o risking any casualties. They didn't. They had 7 hours to figure out what was happening on the ground. The didn't. Shame on those who are responsible for leaving our brave Americans to die, and shame on CNN and the rest of the lap-dog media for helping with the cover-up. Obama is a spineless coward. He does not represent our America. We run into fire to save our brothers and sisters! We do not wait around watching them die in real time. This is not who we are. It is time for Obama, Hillary, Panetta, and Petraus to all go away. Thanks to Gen Ham...and Ty Woods. True American Heroes. You my friend are the spineless coward. There is no physical possibility for any of it to have happened in what you think is real time lol. From the Consulate, as the attack began, Washington was in real time contact with Benghazi. Thank you, this gives some context. You reporting in this comments section seems to be better than CNN's, thanks! I think the point the poster was making is that we see something was happening, and our troops wanted to go in, the wanted the order to go rescue those folks, why was the order not given? It's not, but your example is well below average and therefore misleading. If the press allows the Obama administration to get away with this COVER UP in Benghazi ... they have failed the American people and are certainly treasonness in their negligence !!! Obama is to blame for this!!! You are an fool! If you want to blame Obama for this then you need to call Bush Jr. to account for allowing 9-11 to happen in the first place. His incompetent administration couldn't prevent the worst attack on US soil in history. He followed that up by an unprovoked war that cost several more thousand lives and then finished his time out by destroying the US economy. You need to look in the mirror to find the closest terrorist. Blind support of republican policies is tantamount to being an American Taliban supporter. Turn of Faux news and educate yourself. Wasn't in Bush/Cheney who said criticizing the president while troops are in harms way in unAmerican? If you hate Obama that much, leave the country. Found your own theocratic republic somewhere and take all the other Obama hating closet racist with you! Obozo should have ordered the defense of the American soil. That is part of our country and we were attacked. The area should have been defended and recaptures. Wow, Panetta is a damn fool. You couldn't put forces at risk? What about the 1991 rescue of American embassy staff in Somalia? What a load of bull! The only reason they didnt send aid is because they wanted the Embassy to fall! @#$% you Obama your a disgrace to humanity! There's no way CNN will depart from their liberal slant in the news. Not even when they have the lowest viewership in cable news JFK they realize hat WE stop watching them because if their LIBERAL CONTENT!! Why have an American presence there at all, except for the oil, honestly? Ted Turner's CNN crew should all be holding their heads low. They have to be following orders from someone at the top. Could it be Ted, himself? They ALL know that what they are doing (or should I say, "not doing," ) is shameful. Candy Crowley didn't do enough damage to Romney's campaign during the 2nd debate. They must feel they need to protect Obama from any political fallout from the Bengazhi attack on our embassy. CNN news may never be respected again. The truth will come out with or without CNN's input. Another part of this story that is not getting enough attention is there is a person in jail today because he created a video that hurt someone's feelings. What happened to freedom of speech? Or does that count only when you offend Christian values? OBAMA AND HIS ENTIRE ADMINISTRATION ARE LIARS. THEY'RE REFUSING TO ANSWER ANY QUESTIONS ABOUT THE BENGHAZI TRAGEDY UNTIL AFTER THE ELECTION...THAT'S CONVENIENT! You are ABSOLUTELY correct.... Obama's only defense is that it is being "politicized". Who is the real bull ******* here Mr. Obama???? No, I did not refer to you as "President" on purpose. My oldest son is in Afghanistan. Even tho they are living constantly with the situation of "Friendly" Afghan's killing our troops, our troops are under orders to NOT return fire without first requesting permission.....REALLY? NO flipping way!! What a disgrace for a "Commander in Chief". Mr. O – – u gotta go!! And then- after all this happens Obuma, and all the nit wits that report to him, go on a 14 day crusade to proclaim that it never happened." It was caused by a youtube video- "!!!!! proclaims President Obama to the 3rd world dictators at the UN that he admires so much. At this point, it seems that Obama and his sycophants in the WH didn't want to respond with gunships, SEAL's, etc. because the more of that you do, the more it looks like a WAR, which would horrify the wusses that voted for him 4 years ago. Valerie Jarrett tried to talk him out of getting Bin Laded multiple times; looks like she was more persuasive this time. So Obama says he didn't know about this but in fact he an everyone on his team knew. Panetta said there was no way to help but in fact there wer drones in the air and a number of different forces nearby, some of which were refused permission to help. The lies just keep rolling on and on, don't thye? I am an Independent voter tired of your one sided programs in favor of Obama, Americans need to know the true about what happen in Benghazi and we need it before the election, so time for you all to change you ways and pressure Obama to tell the true and let all Americans view the tapes. AMERICA HAVE A RIGHT TO KNOW. You don't understand. This is not an agenda-free press with the desire to report the facts. Go to your Senators and Congressmen and urge an end to the delay of truth telling. CNN doesn't care. You are feeding the monster here, wasting time. The election is coming and all this energy begging the press to act like the respectable journalists is like asking medical personnel complicit with Nazi experiments to act within the Hippocratic Oath and "do no harm". The bottom line at this point is that Obama lied to us. There may be more to it or maybe not. It's hard to say what was going through Obama's mind when he refused to provide secruity when even (as we now find) Hillary Clinton asked him. Certianly Obama has not been reticent to spend money, he's spent a lot more than any other president. Maybe he wanted to maintain a low profile. However, we were deceived about that. An Panetta – even recon drones have ample armement, there were destroyers off the coast, there were people who wanted to help. The press is spinning a story of 150 attackers but the actual reports from those who were ultimately killed was more like 20. That was the information Panetta had. Why did they let those men die? We may never know. But they lied, lied again and kept on lying. This we know. I find the lack of News on this HUGH story about the death of hero's being killed by their own country leaders a disgrace. If this was a story about a cute puppy it would be on every page with a link. But having Hero's DIE while waiting for support and having that support cancel is a criminal act. So take every award you've ever received and burn them because you and your company and the leaders of are country are cowards. Just hope the next time you call 911 and wait for help it's not cancelled because it's a bad day for bad news. CNN is about as uselss as breasts, (<insert word of choice) on a bull! I would have used the correct wording but I figured it would make front page news on CNN instead of the other more important story we are all commenting on!!! Can I just say that every time I hear that they did not have enough information and needed to assess the situation before they threw our military into harms way-I just want to scream. If I am being attacked on the street and a cop is sitting there with a gun in his holster, I sure hope he doesn't just sit there while he "assesses the risk" he will be under. Please, this is why we have marines-they take risks when we are in danger to save us. CNN, I hope you and the rest of the MSM are ashamed for your lack of coverage. You know it would cost YOUR candidate the election. I agree. You journalists at CNN are gutless cowards! Why don't you do REAL investigative journalism anymore? Why don't you protect the american people from deceptive leaders? You love your position and money too much, I guess. Why aren't 4 dead americans important to you? THREE times – that's THREE times those at Benghazi called for help and it was ordered that those who could help stand down! General Ham lost his job because he chose to disobey and tried to send help. Panetta is a traitor to the American people. And so is the mainstream media. You are absolutely right, all you see or heard from them is Obama Obama. America needs valance and fair news, not one sided one for Obama. We need the true about Benghazi and we need it now, not after the election. I am an Independent voter fed up with your one sided programs. Hillary didn't mind the stain on the blue dress.Do you really think she minds blood on US uniforms? Hillary Clinton cares about position and power. She doesn't care for the american people or their sovreignty. It's deplorable and heart-wrenching to think our brave ex-navy SEALS had no help and they were LEFT BEHIND!!!!!! I thought no man was ever to be left behind? Secretary of Defense Panetta would have the American people believe they didn't know what they are trained to know. The risks in the area were well known but somebody(ies) took their eyes off the ball and as a direct result four Americans were placed in harms way and died. I have not heard of anyone being reprimanded for this costly oversight but you can be sure some individuals in the administration took some real "heat" over this sad event. Does anyone remember "Blackhawk Down"? Putting troops into a situation without knowing what they will see risks additional lives. Criticism should be directed to why security was not better before the attack (but remember it was the consulate, not the main embassy), and why those in the fight didn't have live communication with the general in charge of US Africa Command.